Bulgaria is characterized by a high level of development of the mobile services market. The penetration rate of cellular communication has reached 130% and continues to grow. High-quality GSM covers almost the entire territory, except for areas in the highlands. To make a killing doing the termination, it is important to choose advantageous prepaid offers that GSM operators provide. Mtel is the largest mobile operator on the Bulgarian mobile market. Its subscriber base consists of more than 4.1 million users. The prepaid line from Mtel is called "Prima". The SIM card can be bought for $ 4.5, while the subscriber immediately gets a 50-cent bonus. The standard tariff plan by default is Prima Universal. It provides $0.2 per minute to make a local call to all numbers in the country. When the number is activated by September 3, 2017, the subscriber gets 100 free minutes to make domestic calls. 350 minutes to make on-net calls for $3.4. 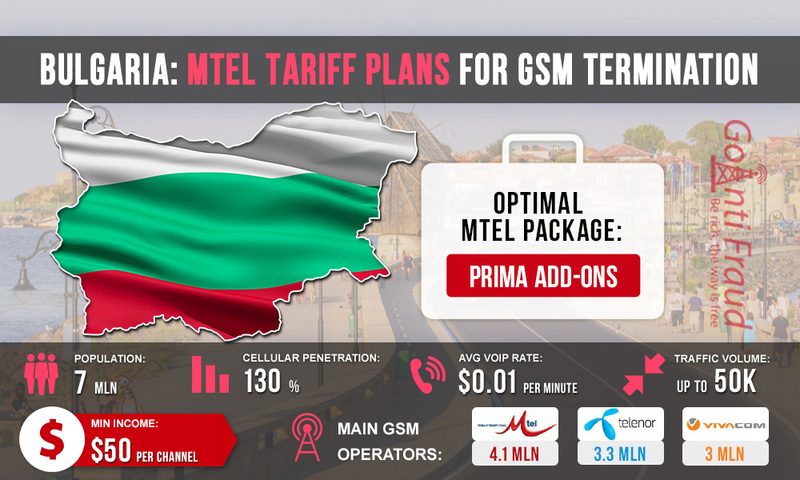 To terminate traffic in Bulgaria, we recommend purchasing Prima Universal SIM-cards and using the 350 Mtel-minutes Prima Add-Ones bonus offer. With an average lifespan of one SIM-card being 3-5 days, the terminator will make $50 from each GSM channel of the installed equipment. To get a steady and high profit, you should reduce business expenses for the purchase of new SI cards and provide reliable protection against Antifraud sim detector systems.